Johnstown, NY Real Estate & Homes for Sale | Coldwell Banker Arlene Sitterly Inc.
"LOTS OF PRIVACY"! 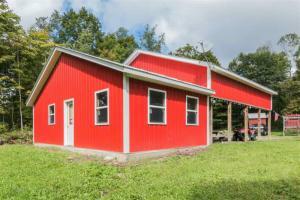 This stainless steel building is situated on 17.8 acres with a beautiful stream running through the property. The property consists of an unfinished apartment in need of insulation, sheet rocking, electric and plumbing. The electric panel is just outside the apt. and the plumbing is in place and just needs to be hooked up. The water supply is a dug well located in small shed w/ pump. There's a camping trailer under the car port w / title that goes with the property. Don't Miss This One !